Schools with HIM programs have a lot on their plates right now. HIM is one of the few professions that has shown signs of life in the job market, with some forecasters going as far as to predict that available positions will soon outnumber qualified applicants. It would seem that the time is ripe for high school graduates and people considering a career change to look into an accredited HIM program. However, there have been several changes in the industry that will pose challenges not only to job candidates but also to the schools themselves. HIM curriculums are in a state of flux. The HITECH Act and the switch to ICD-10 are rewriting large parts of job descriptions. Many employers are shifting their focus from entry-level workers to more highly skilled workers. All these changes are giving HIM program directors plenty to think about. “It’s a difficult time in the field because we have one foot in the here and now, which in some places means a very paper-based health record, and then the other is in electronic records,” says Gail Smith, HIM program director at the University of Cincinnati. 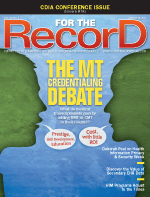 Although hybrid records will never completely go away, many in the industry are trying to meet HITECH Act requirements, and they want to do it quickly. For this reason, there is an overall workforce shortage, although job availability is dependent to some extent on geographic region. Rather than traditional clerical positions, employers are looking for candidates who understand electronic processes. While companies try to figure out how to meet HITECH guidelines for digital records, universities are trying to figure out how best to prepare students. Part of an HIM program director’s job is to maintain contacts with employers to find out what type of characteristics the industry covets. Overwhelmingly, employers are looking for people with solid critical thinking skills who can solve their own problems and manage change. And since more processes are being automated, demand for critical thinking will continue to grow. Although problem-solving skills are at a premium, HIM programs are, by necessity, incorporating more technological elements. And although HIM programs’ foundation is dictated by accrediting bodies, Smith says new content can be incorporated within existing curriculum structures. Some schools are offering completely online coursework to attract nontraditional students, and many are finding ways to help their students receive hands-on experience with electronic records. But technology can have drawbacks as well. Another area of concern is meaningful use. The workforce grants and program guidelines that were issued last year by the Office of the National Coordinator for Health Information Technology to provide workers for health information exchanges and regional extension centers are not available to entry-level candidates, and it’s not yet clear where the jobs will be. Smith recommends that traditional HIM programs execute a gap analysis to determine whether there are elements of the government’s program that should be incorporated into HIM curriculums, possibly allowing more students to qualify for those jobs. To make matters more complicated, looming on the horizon is ICD-10. Beginning this fall, students in two-year programs will learn ICD-9 before transitioning to ICD-10. They’ll have to do this to achieve the twin goals of passing their RHIT exam, which will be on ICD-10 in the spring of 2013, and finding a job after graduation. “[Employers] aren’t going to hire coders in May or June for four or five months prior to the implementation of ICD-10 who have never seen ICD-9,” says Motley. Although ICD-10 isn’t due to take effect until October 2013, preparations are well under way—at least they should be. With two years to go until implementation, HIM programs are laying the groundwork to make the transition as smooth as possible. For example, a faculty member at Sinclair Community College who has already become ICD-10 certified is beginning to train the rest of the HIM staff. Elsewhere, the University of Cincinnati has developed an ICD-10 course. Smith says the reason for the intensive focus is that proper preparation involves more than just training coders. ICD-10 is an implementation process that requires new support systems, and its presence will be felt in many areas of a hospital. With help from HIM education programs across the country, it may be possible to keep the anxiety at a reasonable level.